Hi, I’m Yurai from Tempest Reach NA. I tend to play FOTM classes that interest me, and ninja happens to be one of them. For the first time, we have a class that encourages evading attacks whenever possible, as opposed to tanking as many hits as you can to not interrupt your rotation and maximize DPS. For an action combat game, I felt that this was always something that was missing and it is what drew me to playing ninja. This guide aims to provide perspective on the playstyle of ninja without the talent system (any region outside of Korea). There are many people who are still following Korean guides blindly, and do not understand why they play the way that they do. Hopefully, this will serve to correct that. For new players unfamiliar with the Ninja class, you may want to read Idi0ticGenius’s Ninja guide to understand the basics better. The enrage damage gives you more damage during burn phases, making it the superior choice. Attack speed is not a good roll for the top line. With the attack speed you get from gear, before you even take into account attack speed boosts you gain from being in a party, such as from energy stars, your skills only experience around a 5% bonus in cast speed. Thousand cuts actually gains the most significant boost in cast speed clocking in at around 7%. However, your combo attacks gain under 1% benefit from the 9% roll, so overall, this roll is bad. For the bottom, aside from the basic damage rolls [enraged, attack from behind, increase damage rolls], you should have CDR. This reduces the cooldowns of your main damage skills, which means you don’t have to combo attack as much. Less time spent on your fillers is more DPS. Double cut should make up over 20% of your skill damage breakdown, making it the highest contributor by far. Avalanche can come close to this or possibly surpass this in some fights, but for the most part, your double cut should always be the highest damage. These are the only rolls that increase your damage. Keen Etchings for weapon and gloves provide the highest increase in DPS. You want to be able to guarantee that Fire Avalanche crits. In addition, Burning Heart, Circle of Steel, and Leaves on the Wind all don’t have crit glyphs. Grounded Etchings for armor and boots provide the highest increase in survivability. However, you may choose to go for Relentless if you are interested in slaying or do RMHM without Relentless armor crystals. For this to work, you will need Relentless IV etchings and an HP food. You can optionally roll stun duration decrease instead of Endurance if there are bosses that stun. Ideally, your healers should cleanse, but that doesn’t always happen. Quatrefoil > Quickcarve > Empowered. Crit inner wear is the best for Ninjas for the same reason as the Etching choice. Mathematically, forceful is a higher DPS increase than pounding, even on VM7, which doesn’t have the back damage % base roll. Since ninjas build full crit, they don’t have as much power, so the increase from forceful is more effective. 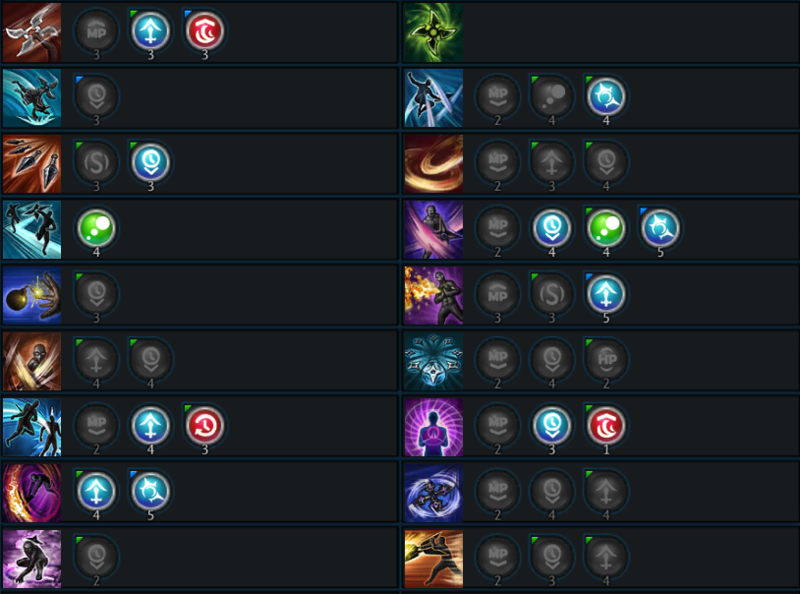 There are two different builds that are viable, both listed below. The CoS1 build is better for shorter fights, such as in score runs. This is because CoS has a lot of damage loaded into the last hit, and it doesn’t have any crit glyph. If it doesn’t crit or if you have to cancel the cast to dodge something, you are losing out on DPS. LotW build is slightly better for longer fights, such as Dreadspire uppers. By removing all the CoS glyphs and adding those points to decoy and combo attack damage, that’s already over a 2% raw damage increase. The difference in damage from CoS and LotW in your breakdown is usually around 4-5%. The remaining difference is made up for the extra burning hearts under the effect of jagged path from the attunement cast speed glyph, and the extra double cuts/skyfalls that you can cast since LotW has a shorter cast time than CoS. The CoS2 build has one flex point that you can put into either Swift Combo Attack or Energetic Attunement. I’d recommend this build if you’re in a coordinated group that can make use of the cooldown reduction on smoke bomb, such as for tryhard Dreadspire uppers runs. If you ever find yourself in a situation where you would find yourself saying, “I wish I had my smoke up 30s faster for my party to use”, then go with this instead of the other two builds. You may see other builds elsewhere, but they are likely meant for KTera, which take talents into account. Those greatly change how the damage breakdown ends up and are not competitive in any other version of Tera. The main talents that allow for their alternate playstyle are CD reduction on skyfall on crits, CD reduction on Attunement on Burning Heart crits, and 60% higher chi generation on Combo Attack. These allow them to focus more on generating chi quickly and maximizing damage through Burning Heart and Skyfall. Since we do not have these critical talents, the build simply doesn’t work outside of Korea. I placed the decoy after the skyfall since the cooldowns line up better this way, but it’s just personal preference and doesn’t affect your overall DPS by much. After the initial start, you should be using decoy based on cooldowns. I wouldn’t bother attempting to reset if double cut has under 2s CD remaining. After that, simply combo attack whenever your primary skills are on CD. If one of your main CD’s become available, immediately stop combo attacking and use it. Even if you’re on the last hit, which does the most damage by far, it’s not worth it since you’re delaying your main skills and combo attack doesn’t even have a crit glyph. To put it into perspective, the last hit does less than half of what circle of steel does and has approximately half the cast time as well. Considering that you don’t prioritize CoS before double cut or skyfall, you shouldn’t in this case as well. Weaving in combo attacks between skills when you have your priority skills off CD is a DPS loss. Using a sample of just double cut, skyfall, and CoS, without attack speed bonuses, the cast time is 3.1s for me without weaving, and 3.95s with weaving in a combo attack before every skill. That means every first hit of combo attack takes around 0.25s to cast, considering I have around 30-40 ping. That means that each combo attack is effectively only reducing your CD by 0.25s instead of 0.5s since you have the opportunity cost of casting other higher damage skills. This is even worse when you’re in a group because you have higher attack speed, and as you’ve learned earlier in the guide, attack speed barely affects combo attack. Use jagged path whenever you can use 2 or more skills after it and it’s off CD. You can hold on to jagged path if you have at least 60-70% of your chi up for burning heart, or fire avalanche. In terms of using jagged path with avalanche, if you have at least +69 attack speed (including 19 from standard gear), you can use jagged path before all 3 hits, otherwise, squeeze in jagged path between your first and second cast of avalanche. If you’re using the LotW build, this can be achieved with just casting attunement and popping Lein’s Dark Root Beer (in a solo setting, not even with a healer or brooch attack speed). Decoy jutsu and impact bomb can both cancel skill animations, including retaliate. Make use of this on decoy by using it as soon as your last damage hit occurs to eliminate a bit of the animation afterwards. You can also use decoy to iframe once you are confident with the fight since it has a very short iframe attached to it. Impact bomb can be used to reposition as well — don’t always rely on shadow jump to reposition when you can use impact bomb which does damage on top of repositioning. You should also practice using impact bomb to gap close to the boss by turning your camera to cast the skill, and resetting the camera position afterwards. For inexperienced parties, this skill can be used to save everyone from a wipe in many dungeons as most attacks can be iframed using this skill. However, in a more experienced party, you want to use this to skip forced mechanics that can one shot your party so that you can continue DPSing. This is one of the main skills that make ninjas better than other DPS classes. Even if every DPS class was balanced to the point of dealing the same damage, smoke bomb is the utility skill that will give ninjas the extra edge, especially in relevant fights. This skill is useful if you iframe backwards since it’ll put you out of reach of the boss. Double Cut and Skyfall both only hit once from that range, but if you use Chakra Thrust first, the skill itself will connect and so will all the hits of Double Cut and Skyfall. This should be used off cooldown in most cases. More chi directly equates to higher DPS as fire avalanche is your burst skill and burning heart takes the place of your weak combo attacks when your primary skills are on CD. The actual damage of burning heart comes just as close or higher in terms of DPS compared to your primary skills, but there’s no reason to keep your primary skills off CD when you could be doing more damage in place of your combo chain. When using the LotW build, it can be okay to delay your attunement by a bit if you know for a fact that you can get through your entire chi bar with BH uninterrupted, or if you need the extra attack speed to pull off JP > 3x FA. This should only be used as a filler if you can’t get in range of the boss and all your other ranged skills are on cooldown. Keep up intense focus as much as possible, but not at the expense of needing to dodge out of your rotation often. There are some bosses that make this very difficult or near impossible, but a good rule of thumb is that it’s probably not worth it if you have to dodge more than 2-3 times per 10 seconds. Having it up at maximum stacks offers a 10% DPS boost, so it’s safe to say that if you spend more than 10% of your time iframing, it’s not really worth it. You should use your judgment on this based on knowing the boss’s long term patterns as it may well be possible for them to do a number of short attacks in some period, but not perform attacks that will hit you for a good amount of time afterwards. This skill provides a raw % based damage boost instead of being additive with your crystal and weapon rolls. A very special thanks to Floss for proofreading and helping out with the formatting. For anyone looking to write a guide, just let her do the formatting. I tried to do so myself, but still needed a bunch of help. – Redstrike, for pioneering the LotW build. He was the first one to try it out, and I did my own testing afterwards. – Mystletoe, for carrying Chunt to Queen in Manaya’s Core and letting me leech to take the banner screenshot. Chunt had great difficulty with Melkatran. New question: I’m in full +15 Ambush, and I see better damage numbers while using a Pounding dyad instead of a Forceful (not necessarily a lot better, just better). Is it possible that the extra damage from the dyad really does up the damage more than a forceful at this point? Or are they pretty much the same? It’s situational. Pounding is slightly better when boss is non-enraged since you have less % damage modifiers, but as burn phases are generally when boss is enraged, it’s better to use forceful overall. Hi, quick question. I noticed that every now and then, Decoy Jutsu would do twice as much damage as it usually does. Do you know why? is there some hidden mechanics? I’m soloing IoD BAMs when I notice that, so it’s not due to an outside buff. Lot of variables for that, I’m guessing it’s either you picked up a keening mote or your crystal setup e.g. more critical power vs enraged, crit power from behind, ect. Sometimes the mob turns around before decoy hits so it counts as a frontal attack vs rear despite teleporting to the area that used to be behind them. Even your weapon rolls could add up to 20% or so more damage if the mob is enraged and you attack from behind. Factor in some crystals and there’s some pretty vast disparity in damage between face hitting a calm mob and rear attacking an enraged one. I’m not stupid enough to compare the damage without a mote to damage with one. I use Chakra Thrust to stun the BAMs before using Decoy, so they don’t get to turn around, either. The only other factor would be enrage, but even that shouldn’t account for double the damage (and even if it did, I’d see that damage discrepancy on all my skills, not just Decoy). I know it might be stupid of a question, but why you didn’t mentioned One thousand cuts at all? OTC should be used more as an iframe that does damage rather than a damage skill that iframes. Any advice on the optimal crit factor cap ? When do we get 100% on FA per exemple ? I’d also like a reply to this. I’m currently at 54 + 254 crit factor, is that too much or not enough (although I’m not sure I could go higher)? You can get power on belt/brooch. Overall, you won’t notice any difference either way you go. Crit resist this patch is much higher and you won’t cap out. Check the weapon rolls section that explains the difference in attack speed. In general, you will get your primary skills off roughly 5% faster. I don’t think there is any measurable DPS difference between the two glyphs, which is why I leave it as a choice. I wouldn’t bother using CoS2 for SSHM. I’ve only been running it in dreadspire where there’s a noticeable difference with having smoke up 30s earlier on certain bosses. So this guide only covers the skill rotation at optimal crit. What about ninja that are working toward end game gear? What should their crystal and skill rotation/glyph be? Oh and thanks for the guide, very coherent and detailed! Having less crit wouldn’t change anything. Your priorities are still the same regardless of crit factor. Jagged Path > Double cut > Skyfall > Decoy Jutsu > Double cut (if resets) > Circle of steel/Leaves on the Wind. For the “Skill Usage” Rotation – you could please write the names of the skills. I don’t memorise the pictures of them so I have no idea what this rotation is. So no Blazing Attunement? Don’t you think the cooldown reduction on Attunement worth less than the increased cast speed of both Burning Heart (which, even with my high ping, deals a lot of damage) and Fire Avalanche? It’s like you’re completely dismissing Burning Heart’s uses as a long range DPS vs AoE phases. Not to mention Ninja that are lacking in crit factor might find CoS very weak. My opinion is that there’s really no room for Blazing Attunement in the normal hybrid build. 12 seconds on Attunement is pretty important because of how often you need to use it and with it, it flows better with your normal rotation as you’ll be able to generate about 1500-2000 Chi between every Attunement cast. Blazing Attunement often forces you to wait until you already have 500 Chi to use it instead of putting Attunement on cooldown faster. Burning Heart’s use as a long range DPS skill is only really applicable towards Dakuryon in SS. I don’t believe that CoS is weaker with low Crit Factor as the last hit has the same chances to crit as the first 5 and no other Ninja skills that you would use instead of CoS have any Crit glyphs. I’ve been running Blazing Attunement for a few weeks now. Blazing Attuentment vs Attunement CDR results in about the same # of Burning Heart hits for me. 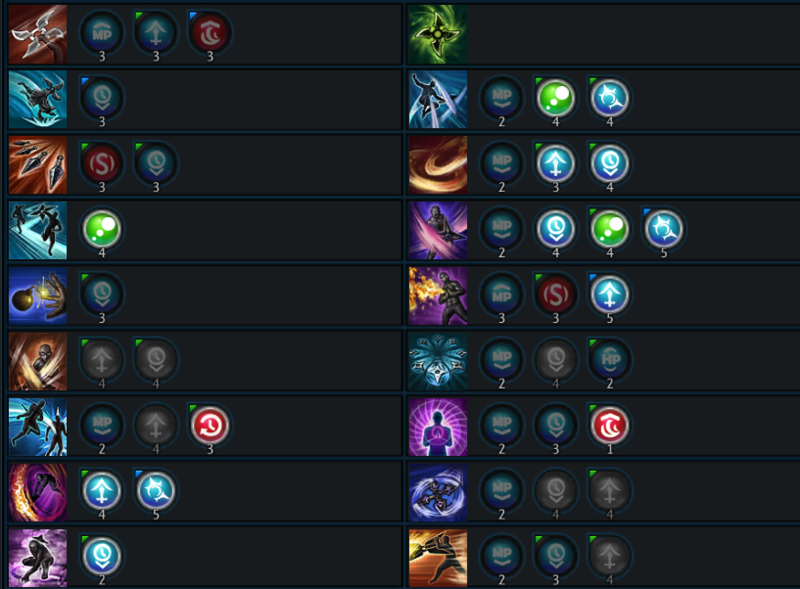 Idk maybe I don’t know how to play with Attunement CDR but if I’m pretty sure I always use it off CD. I think it’s definitely a good glyph. It’s very strong and adds a lot for when you need to JP > BH or JP > FA x3. I’m just not sure about what you could take out for it. Swift Combo Attack and Energetic Attunement would be the only two glyphs that I could see being optional. I just swapped Attunement CD for Blazing Attunement. Not very efficient on points but I’ve preferred it ever since I tried it because of the speed cast on FA. Just my 2 cents. I don’t think the speed on Attunement is worth it on the CoS build. The only thing you could potentially swap out is Attunement CDR, which would also leave you with enough points to glyph smoke CDR if you really wanted to. The attack speed on combo attack is good because it’s pretty much guaranteed to proc right before you cast your primary DPS skills, which is where it actually matters, so you don’t want to be swapping that out. You may be casting one round of BH faster with the blazing glyph, but you also lose out on having your chi up earlier, which could be the difference between having it for while the boss is enraged and while it isn’t. The only use case for a long range BH is on SSHM 2nd boss. If the run is slow, you’re better off getting the attunement CDR so you can cast more BH rather than casting it all quickly and being left with nothing to do. Not to mention, if the run is a slow run, I recommend using the LotW build instead, which carries both glyphs. In a score run scenario, you’d be running the CoS build, and in that case, whether or not the boss is doing AoE phase is pretty much irrelevant. 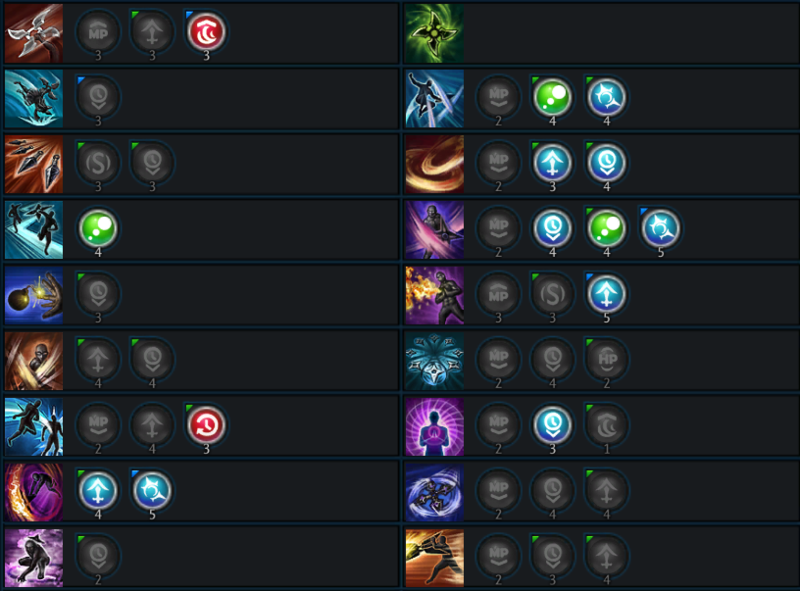 I’m not sure how the crit factor falls into the glyphs discussion. In any case, low crit ninjas probably aren’t in any fast runs, so they should be using the LotW build, which offers more consistency anyway. Yeah I get what you’re saying with the enrage thing but I just love the feel of speed casted FA (especially during the burns)/BH that I can’t go back. All the #1 logs were with the Blazing Attunement so I guess I’ll be that one weird guy with Blazing Attunement until they patch the Attunement cancel bug. Well, after they fixed the Attunement cancel bug, did you change it back to the CDR glyph or still Blazing?